"Flying machine" redirects here. For other uses, see Flying machine (disambiguation). The Mil Mi-8 is the most-produced helicopter in history. The Cessna 172 Skyhawk is the most produced aircraft in history. An aircraft is a machine that is able to fly by gaining support from the air. It counters the force of gravity by using either static lift or by using the dynamic lift of an airfoil, or in a few cases the downward thrust from jet engines. Common examples of aircraft include airplanes, helicopters, airships (including blimps), gliders, and hot air balloons. The human activity that surrounds aircraft is called aviation. The science of aviation, including designing and building aircraft, is called aeronautics. Crewed aircraft are flown by an onboard pilot, but unmanned aerial vehicles may be remotely controlled or self-controlled by onboard computers. Aircraft may be classified by different criteria, such as lift type, aircraft propulsion, usage and others. Pioneers of flight, from the earliest experiments to 1914. First World War, 1914 to 1918. Aviation between the World Wars, 1918 to 1939. Second World War, 1939 to 1945. Postwar era, also called the jet age, 1945 to the present day. Aerostats use buoyancy to float in the air in much the same way that ships float on the water. They are characterized by one or more large gasbags or canopies, filled with a relatively low-density gas such as helium, hydrogen, or hot air, which is less dense than the surrounding air. When the weight of this is added to the weight of the aircraft structure, it adds up to the same weight as the air that the craft displaces. Small hot-air balloons called sky lanterns were first invented in ancient China prior to the 3rd century BC and used primarily in cultural celebrations, and were only the second type of aircraft to fly, the first being kites which were first invented in ancient China over two thousand years ago (see Han Dynasty). A balloon was originally any aerostat, while the term airship was used for large, powered aircraft designs – usually fixed-wing. In 1919 Frederick Handley Page was reported as referring to "ships of the air," with smaller passenger types as "Air yachts." In the 1930s, large intercontinental flying boats were also sometimes referred to as "ships of the air" or "flying-ships". – though none had yet been built. The advent of powered balloons, called dirigible balloons, and later of rigid hulls allowing a great increase in size, began to change the way these words were used. Huge powered aerostats, characterized by a rigid outer framework and separate aerodynamic skin surrounding the gas bags, were produced, the Zeppelins being the largest and most famous. There were still no fixed-wing aircraft or non-rigid balloons large enough to be called airships, so "airship" came to be synonymous with these aircraft. Then several accidents, such as the Hindenburg disaster in 1937, led to the demise of these airships. Nowadays a "balloon" is an unpowered aerostat and an "airship" is a powered one. A powered, steerable aerostat is called a dirigible. Sometimes this term is applied only to non-rigid balloons, and sometimes dirigible balloon is regarded as the definition of an airship (which may then be rigid or non-rigid). Non-rigid dirigibles are characterized by a moderately aerodynamic gasbag with stabilizing fins at the back. These soon became known as blimps. During the Second World War, this shape was widely adopted for tethered balloons; in windy weather, this both reduces the strain on the tether and stabilizes the balloon. The nickname blimp was adopted along with the shape. In modern times, any small dirigible or airship is called a blimp, though a blimp may be unpowered as well as powered. Heavier-than-air aircraft, such as airplanes, must find some way to push air or gas downwards, so that a reaction occurs (by Newton's laws of motion) to push the aircraft upwards. This dynamic movement through the air is the origin of the term aerodyne. There are two ways to produce dynamic upthrust: aerodynamic lift, and powered lift in the form of engine thrust. Aerodynamic lift involving wings is the most common, with fixed-wing aircraft being kept in the air by the forward movement of wings, and rotorcraft by spinning wing-shaped rotors sometimes called rotary wings. A wing is a flat, horizontal surface, usually shaped in cross-section as an aerofoil. To fly, air must flow over the wing and generate lift. A flexible wing is a wing made of fabric or thin sheet material, often stretched over a rigid frame. A kite is tethered to the ground and relies on the speed of the wind over its wings, which may be flexible or rigid, fixed, or rotary. With powered lift, the aircraft directs its engine thrust vertically downward. V/STOL aircraft, such as the Harrier Jump Jet and F-35B take off and land vertically using powered lift and transfer to aerodynamic lift in steady flight. A pure rocket is not usually regarded as an aerodyne, because it does not depend on the air for its lift (and can even fly into space); however, many aerodynamic lift vehicles have been powered or assisted by rocket motors. Rocket-powered missiles that obtain aerodynamic lift at very high speed due to airflow over their bodies are a marginal case. The forerunner of the fixed-wing aircraft is the kite. Whereas a fixed-wing aircraft relies on its forward speed to create airflow over the wings, a kite is tethered to the ground and relies on the wind blowing over its wings to provide lift. Kites were the first kind of aircraft to fly, and were invented in China around 500 BC. Much aerodynamic research was done with kites before test aircraft, wind tunnels, and computer modelling programs became available. The first heavier-than-air craft capable of controlled free-flight were gliders. A glider designed by George Cayley carried out the first true manned, controlled flight in 1853. Wing support – Braced or cantilever, rigid, or flexible. Wing planform – including aspect ratio, angle of sweep, and any variations along the span (including the important class of delta wings). Location of the horizontal stabilizer, if any. Dihedral angle – positive, zero, or negative (anhedral). A variable geometry aircraft can change its wing configuration during flight. A flying wing has no fuselage, though it may have small blisters or pods. The opposite of this is a lifting body, which has no wings, though it may have small stabilizing and control surfaces. Wing-in-ground-effect vehicles are not considered aircraft. They "fly" efficiently close to the surface of the ground or water, like conventional aircraft during takeoff. An example is the Russian ekranoplan (nicknamed the "Caspian Sea Monster"). Man-powered aircraft also rely on ground effect to remain airborne with a minimal pilot power, but this is only because they are so underpowered—in fact, the airframe is capable of flying higher. Rotorcraft, or rotary-wing aircraft, use a spinning rotor with aerofoil section blades (a rotary wing) to provide lift. Types include helicopters, autogyros, and various hybrids such as gyrodynes and compound rotorcraft. Autogyros have unpowered rotors, with a separate power plant to provide thrust. The rotor is tilted backward. As the autogyro moves forward, air blows upward across the rotor, making it spin. This spinning increases the speed of airflow over the rotor, to provide lift. Rotor kites are unpowered autogyros, which are towed to give them forward speed or tethered to a static anchor in high-wind for kited flight. Cyclogyros rotate their wings about a horizontal axis. Compound rotorcraft have wings that provide some or all of the lift in forward flight. They are nowadays classified as powered lift types and not as rotorcraft. Tiltrotor aircraft (such as the V-22 Osprey), tiltwing, tailsitter, and coleopter aircraft have their rotors/propellers horizontal for vertical flight and vertical for forward flight. A lifting body is an aircraft body shaped to produce lift. If there are any wings, they are too small to provide significant lift and are used only for stability and control. Lifting bodies are not efficient: they suffer from high drag, and must also travel at high speed to generate enough lift to fly. Many of the research prototypes, such as the Martin-Marietta X-24, which led up to the Space Shuttle, were lifting bodies (though the shuttle itself is not), and some supersonic missiles obtain lift from the airflow over a tubular body. Powered lift types rely on engine-derived lift for vertical takeoff and landing (VTOL). Most types transition to fixed-wing lift for horizontal flight. Classes of powered lift types include VTOL jet aircraft (such as the Harrier jump-jet) and tiltrotors (such as the V-22 Osprey), among others. A few experimental designs rely entirely on engine thrust to provide lift throughout the whole flight, including personal fan-lift hover platforms and jetpacks. VTOL research designs include the flying Bedstead. The Flettner airplane uses a rotating cylinder in place of a fixed wing, obtaining lift from the magnus effect. The ornithopter obtains thrust by flapping its wings. The smallest aircraft are toys, and—even smaller – nano-aircraft. The largest aircraft by dimensions and volume (as of 2016) is the 302-foot-long (about 95 meters) British Airlander 10, a hybrid blimp, with helicopter and fixed-wing features, and reportedly capable of speeds up to 90 mph (about 150 km/h), and an airborne endurance of two weeks with a payload of up to 22,050 pounds (11 tons). The largest aircraft by weight and largest regular fixed-wing aircraft ever built (as of 2016), is the Antonov An-225. That Ukrainian-built 6-engine Russian transport of the 1980s is 84 meters (276 feet) long, with an 88-meter (289 foot) wingspan. It holds the world payload record, after transporting 428,834 pounds (200 tons) of goods, and has recently flown 100-ton loads commercially. Weighing in at somewhere between 1.1 and 1.4 million pounds (550–700 tons) maximum loaded weight, it is also the heaviest aircraft to be built, to date. It can cruise at 500 mph. The largest military airplanes are the Ukrainian/Russian Antonov An-124 (world's second-largest airplane, also used as a civilian transport), and American Lockheed C-5 Galaxy transport, weighing, loaded, over 765,000 pounds (over 380 tons). The 8-engine, piston/propeller Hughes HK-1 "Spruce Goose," an American World War II wooden flying boat transport—with a greater wingspan (94 meters / 260 feet) than any current aircraft, and a tail-height equal to the tallest (Airbus A380-800 at 24.1 meters / 78 feet) – flew only one short hop in the late 1940s, and never flew out of ground effect. The largest civilian airplanes, apart from the above-noted An-225 and An-124, are the Airbus Beluga cargo transport derivative of the Airbus A300 jet airliner, the Boeing Dreamlifter cargo transport derivative of the Boeing 747 jet airliner/transport (the 747-200B was, at its creation in the 1960s, the heaviest aircraft ever built, with a maximum weight of 836,000 pounds (over 400 tons)), and the double-decker Airbus A380 "super-jumbo" jet airliner (the world's largest passenger airliner). The fastest recorded powered aircraft flight and fastest recorded aircraft flight of an air-breathing powered aircraft was of the NASA X-43A Pegasus, a scramjet-powered, hypersonic, lifting body experimental research aircraft, at Mach 9.6 (nearly 7,000 mph). The X-43A set that new mark, and broke its own world record (of Mach 6.3, nearly 5,000 mph, set in March, 2004) on its third and final flight on Nov. 16, 2004. Prior to the X-43A, the fastest recorded powered airplane flight (and still the record for the fastest manned, powered airplane / fastest manned, non-spacecraft aircraft) was of the North American X-15A-2, rocket-powered airplane at 4,520 mph (7,274 km/h), Mach 6.72, on October 3, 1967. On one flight it reached an altitude of 354,300 feet. The fastest fixed-wing aircraft, and fastest glider, is the Space Shuttle, a rocket-glider hybrid, which has re-entered the atmosphere as a fixed-wing glider at over Mach 25 (over 25 times the speed of sound—about 17,000 mph at re-entry to Earth's atmosphere). The fastest military airplane ever built: Lockheed SR-71 Blackbird, a U.S. reconnaissance jet fixed-wing aircraft, known to fly beyond Mach 3.3 (about 2,200 mph at cruising altitude). On July 28, 1976, an SR-71 set the record for the fastest and highest-flying operational aircraft with an absolute speed record of 2,193 mph and an absolute altitude record of 85,068 feet. At its retirement in the January 1990, it was the fastest air-breathing aircraft / fastest jet aircraft in the world—a record still standing as of August, 2016. Note: Some sources refer to the above-mentioned X-15 as the "fastest military airplane" because it was partly a project of the U.S. Navy and Air Force; however, the X-15 was not used in non-experimental actual military operations. The fastest current military aircraft are the Soviet/Russian MiG-25—capable of Mach 3.2 (2,170 mph), at the expense of engine damage, or Mach 2.83 (1,920 mph) normally—and the Russian MiG-31E (also capable of Mach 2.83 normally). Both are fighter-interceptor jet airplanes, in active operations as of 2016. The fastest civilian airplane ever built, and fastest passenger airliner ever built: the briefly operated Tupolev Tu-144 supersonic jet airliner (Mach 2.35, 1,600 mph, 2,587 km/h), which was believed to cruise at about Mach 2.2. The Tu-144 (officially operated from 1968 to 1978, ending after two crashes of the small fleet) was outlived by its rival, the Concorde SST (Mach 2.23), a French/British supersonic airliner, known to cruise at Mach 2.02 (1.450 mph, 2,333 kmh at cruising altitude), operating from 1976 until the small Concorde fleet was grounded permanently in 2003, following the crash of one in the early 2000s. The fastest airliner currently flying is the Boeing 747, quoted as being capable of cruising over Mach 0.885 (over 550 mph). Previously, the fastest were the troubled, short-lived Russian (Soviet Union) Tupolev Tu-144 SST (Mach 2.35) and the French/British Concorde SST (Mach 2.23, normally cruising at Mach 2) . Before them, the Convair 990 Coronado jet airliner of the 1960s flew at over 600 mph. Gliders are heavier-than-air aircraft that do not employ propulsion once airborne. Take-off may be by launching forward and downward from a high location, or by pulling into the air on a tow-line, either by a ground-based winch or vehicle, or by a powered "tug" aircraft. For a glider to maintain its forward air speed and lift, it must descend in relation to the air (but not necessarily in relation to the ground). Many gliders can 'soar' – gain height from updrafts such as thermal currents. The first practical, controllable example was designed and built by the British scientist and pioneer George Cayley, whom many recognise as the first aeronautical engineer. Common examples of gliders are sailplanes, hang gliders and paragliders. Kites are aircraft that are tethered to the ground or other object (fixed or mobile) that maintains tension in the tether or kite line; they rely on virtual or real wind blowing over and under them to generate lift and drag. Kytoons are balloon-kite hybrids that are shaped and tethered to obtain kiting deflections, and can be lighter-than-air, neutrally buoyant, or heavier-than-air. Powered aircraft have one or more onboard sources of mechanical power, typically aircraft engines although rubber and manpower have also been used. Most aircraft engines are either lightweight piston engines or gas turbines. Engine fuel is stored in tanks, usually in the wings but larger aircraft also have additional fuel tanks in the fuselage. Propeller aircraft use one or more propellers (airscrews) to create thrust in a forward direction. The propeller is usually mounted in front of the power source in tractor configuration but can be mounted behind in pusher configuration. Variations of propeller layout include contra-rotating propellers and ducted fans. Many kinds of power plant have been used to drive propellers. Early airships used man power or steam engines. The more practical internal combustion piston engine was used for virtually all fixed-wing aircraft until World War II and is still used in many smaller aircraft. Some types use turbine engines to drive a propeller in the form of a turboprop or propfan. Human-powered flight has been achieved, but has not become a practical means of transport. Unmanned aircraft and models have also used power sources such as electric motors and rubber bands. Jet aircraft use airbreathing jet engines, which take in air, burn fuel with it in a combustion chamber, and accelerate the exhaust rearwards to provide thrust. Turbojet and turbofan engines use a spinning turbine to drive one or more fans, which provide additional thrust. An afterburner may be used to inject extra fuel into the hot exhaust, especially on military "fast jets". Use of a turbine is not absolutely necessary: other designs include the pulse jet and ramjet. These mechanically simple designs cannot work when stationary, so the aircraft must be launched to flying speed by some other method. Other variants have also been used, including the motorjet and hybrids such as the Pratt & Whitney J58, which can convert between turbojet and ramjet operation. Some rotorcraft, such as helicopters, have a powered rotary wing or rotor, where the rotor disc can be angled slightly forward so that a proportion of its lift is directed forwards. The rotor may, like a propeller, be powered by a variety of methods such as a piston engine or turbine. Experiments have also used jet nozzles at the rotor blade tips. Rocket-powered aircraft have occasionally been experimented with, and the Messerschmitt Komet fighter even saw action in the Second World War. Since then, they have been restricted to research aircraft, such as the North American X-15, which traveled up into space where air-breathing engines cannot work (rockets carry their own oxidant). Rockets have more often been used as a supplement to the main power plant, typically for the rocket-assisted take off of heavily loaded aircraft, but also to provide high-speed dash capability in some hybrid designs such as the Saunders-Roe SR.53. The ornithopter obtains thrust by flapping its wings. It has found practical use in a model hawk used to freeze prey animals into stillness so that they can be captured, and in toy birds. The structure comprises the main load-bearing elements and associated equipment. The propulsion system (if it is powered) comprises the power source and associated equipment, as described above. The avionics comprise the control, navigation and communication systems, usually electrical in nature. The approach to structural design varies widely between different types of aircraft. Some, such as paragliders, comprise only flexible materials that act in tension and rely on aerodynamic pressure to hold their shape. A balloon similarly relies on internal gas pressure but may have a rigid basket or gondola slung below it to carry its payload. Early aircraft, including airships, often employed flexible doped aircraft fabric covering to give a reasonably smooth aeroshell stretched over a rigid frame. Later aircraft employed semi-monocoque techniques, where the skin of the aircraft is stiff enough to share much of the flight loads. In a true monocoque design there is no internal structure left. The key structural parts of an aircraft depend on what type it is. Lighter-than-air types are characterised by one or more gasbags, typically with a supporting structure of flexible cables or a rigid framework called its hull. Other elements such as engines or a gondola may also be attached to the supporting structure. Heavier-than-air types are characterised by one or more wings and a central fuselage. The fuselage typically also carries a tail or empennage for stability and control, and an undercarriage for takeoff and landing. Engines may be located on the fuselage or wings. On a fixed-wing aircraft the wings are rigidly attached to the fuselage, while on a rotorcraft the wings are attached to a rotating vertical shaft. Smaller designs sometimes use flexible materials for part or all of the structure, held in place either by a rigid frame or by air pressure. The fixed parts of the structure comprise the airframe. The avionics comprise the flight control systems and related equipment, including the cockpit instrumentation, navigation, radar, monitoring, and communication systems. The flight envelope of an aircraft refers to its approved design capabilities in terms of airspeed and load factor or altitude. The term can also refer to other assessments of aircraft performance such as maneuverability. When an aircraft is abused, for instance by diving it at too-high a speed, it is said to be flown outside the envelope, something considered foolhardy since it has been taken beyond the design limits which have been established by the manufacturer. Going beyond the envelope may have a known outcome such as flutter or entry to a non-recoverable spin (possible reasons for the boundary). The Boeing 777-200LR is the longest-range airliner, capable of flights of more than halfway around the world. The range is the distance an aircraft can fly between takeoff and landing, as limited by the time it can remain airborne. For a powered aircraft the time limit is determined by the fuel load and rate of consumption. Flight dynamics is the science of air vehicle orientation and control in three dimensions. The three critical flight dynamics parameters are the angles of rotation around three axes which pass through the vehicle's center of gravity, known as pitch, roll, and yaw. 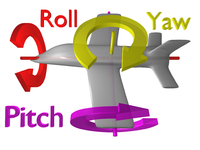 Roll is a rotation about the longitudinal axis (equivalent to the rolling or heeling of a ship) giving an up-down movement of the wing tips measured by the roll or bank angle. Pitch is a rotation about the sideways horizontal axis giving an up-down movement of the aircraft nose measured by the angle of attack. Yaw is a rotation about the vertical axis giving a side-to-side movement of the nose known as sideslip. Flight dynamics is concerned with the stability and control of an aircraft's rotation about each of these axes. An aircraft that is unstable tends to diverge from its current flight path and so is difficult to fly. A very stable aircraft tends to stay on its current flight path and is difficult to manoeuvre—so it is important for any design to achieve the desired degree of stability. Since the widespread use of digital computers, it is increasingly common for designs to be inherently unstable and rely on computerised control systems to provide artificial stability. A fixed wing is typically unstable in pitch, roll, and yaw. Pitch and yaw stabilities of conventional fixed wing designs require horizontal and vertical stabilisers, which act similarly to the feathers on an arrow. These stabilizing surfaces allow equilibrium of aerodynamic forces and to stabilise the flight dynamics of pitch and yaw. They are usually mounted on the tail section (empennage), although in the canard layout, the main aft wing replaces the canard foreplane as pitch stabilizer. Tandem wing and Tailless aircraft rely on the same general rule to achieve stability, the aft surface being the stabilising one. A rotary wing is typically unstable in yaw, requiring a vertical stabiliser. A balloon is typically very stable in pitch and roll due to the way the payload is hung underneath. Flight control surfaces enable the pilot to control an aircraft's flight attitude and are usually part of the wing or mounted on, or integral with, the associated stabilizing surface. Their development was a critical advance in the history of aircraft, which had until that point been uncontrollable in flight. Aerospace engineers develop control systems for a vehicle's orientation (attitude) about its center of mass. The control systems include actuators, which exert forces in various directions, and generate rotational forces or moments about the aerodynamic center of the aircraft, and thus rotate the aircraft in pitch, roll, or yaw. For example, a pitching moment is a vertical force applied at a distance forward or aft from the aerodynamic center of the aircraft, causing the aircraft to pitch up or down. Control systems are also sometimes used to increase or decrease drag, for example to slow the aircraft to a safe speed for landing. The two main aerodynamic forces acting on any aircraft are lift supporting it in the air and drag opposing its motion. Control surfaces or other techniques may also be used to affect these forces directly, without inducing any rotation. Aircraft permit long distance, high speed travel and may be a more fuel efficient mode of transportation in some circumstances. Aircraft have environmental and climate impacts beyond fuel efficiency considerations, however. They are also relatively noisy compared to other forms of travel and high altitude aircraft generate contrails, which experimental evidence suggests may alter weather patterns. Aircraft are produced in several different types optimized for various uses; military aircraft, which includes not just combat types but many types of supporting aircraft, and civil aircraft, which include all non-military types, experimental and model. Combat aircraft are aircraft designed to destroy enemy equipment using its own armament. Combat aircraft divide broadly into fighters and bombers, with several in-between types such as fighter-bombers and ground-attack aircraft (including attack helicopters). Non-combat aircraft are not designed for combat as their primary function, but may carry weapons for self-defense. Non-combat roles include search and rescue, reconnaissance, observation, transport, training, and aerial refueling. These aircraft are often variants of civil aircraft. Most military aircraft are powered heavier-than-air types. Other types such as gliders and balloons have also been used as military aircraft; for example, balloons were used for observation during the American Civil War and World War I, and military gliders were used during World War II to land troops. Commercial aircraft include types designed for scheduled and charter airline flights, carrying passengers, mail and other cargo. The larger passenger-carrying types are the airliners, the largest of which are wide-body aircraft. Some of the smaller types are also used in general aviation, and some of the larger types are used as VIP aircraft. General aviation is a catch-all covering other kinds of private (where the pilot is not paid for time or expenses) and commercial use, and involving a wide range of aircraft types such as business jets (bizjets), trainers, homebuilt, gliders, warbirds and hot air balloons to name a few. The vast majority of aircraft today are general aviation types. An experimental aircraft is one that has not been fully proven in flight, or that carries an FAA Special Airworthiness Certificate called an Experimental Certificate. Often, this implies that the aircraft is testing new aerospace technologies, though the term also refers to amateur and kit-built aircraft, many of which are based on proven designs. A model aircraft is a small unmanned type made to fly for fun, for static display, for aerodynamic research or for other purposes. A scale model is a replica of some larger design. ^ "Aircraft - Define Aircraft at Dictionary.com". Dictionary.com. Archived from the original on 28 March 2015. Retrieved 1 April 2015. ^ "Different Kinds & Types of Aircraft". www.wingsoverkansas.com. Archived from the original on 21 November 2016. ^ US patent 467069 Archived 23 February 2014 at the Wayback Machine "Air-ship" referring to a compound aerostat/rotorcraft. ^ Ezekiel Airship (1902) wright-brothers.org Archived 3 December 2013 at the Wayback Machinealtereddimensions.net Archived 22 February 2014 at the Wayback Machine "airship," – referring to an HTA aeroplane. ^ The Bridgeport Herald, August 18, 1901 Archived 3 August 2013 at the Wayback Machine – "air ship" referring to Whitehead's aeroplane. ^ Cooley Airship of 1910, also called the Cooley monoplane. "Unbelievable Flying Objects". Archived from the original on 2 November 2013. Retrieved 10 February 2014. "Archived copy". Archived from the original on 2 April 2012. Retrieved 2011-09-07. CS1 maint: Archived copy as title (link) – a heavier-than-air monoplane. ^ Frater, A.; The Balloon Factory, Picador (2009), p. 163. Wright brothers' "airship." ^ The Sydney Morning Herald, Monday 11 April 1938 – "ship of the airs," "flying-ship," referring to a large flying-boat. ^ Smithsonian, America by air Archived 18 January 2014 at the Wayback Machine "Ships of the Air" referring to Pan Am's Boeing Clipper flying-boat fleet. ^ "World's largest aircraft the Airlander makes maiden flight in UK," Archived 22 November 2016 at the Wayback Machine 16 Aug 2016, London 'Daily Telegraph' via Telegraph.co.uk, retrieved November 22, 2016. ^ [ "Airlander 10, the world's largest aircraft, takes off for the first time,"] August 19, 2016, CBS News(TV) retrieved November 22, 2016. ^ Kottasova, Ivana "The world's largest aircraft crashes after 2nd test flight" Archived 22 November 2016 at the Wayback Machine, August 24, 2016, CNN Tech on CNN, the Cable News Network, retrieved November 22, 2016. ^ July, Dyre. "Fly Drive Aanbiedingen". www.flydrivereizen.nl. Archived from the original on 4 November 2016. ^ "Watch the world's biggest plane land in Australia," Archived 22 November 2016 at the Wayback Machine May 16, 2016, Fox News, retrieved November 22, 2016. ^ Rumbaugh, Andrea, "World's biggest airplane lands at Bush airport," Archived 23 November 2016 at the Wayback Machine Updated November 18, 2016, Houston Chonicle / Chron.com, retrieved November 22, 2016. ^ Lewis, Danny, "The World's Largest Aircraft Might Lose its Title to a Blimp,", September 18, 2015, Smart News, Smithsonian.com, Smithsonian Institution, Washington, D.C., retrieved November 22, 2016. ^ a b c d "Ask Us – Largest Plane in the World," Aerospaceweb.org, retrieved November 22, 2016. ^ "World's Second Largest Aircraft," Archived 22 November 2016 at the Wayback Machine July 28th, 2013, NASA, retrieved November 22, 2016. ^ a b Loftin, Laurence K., Jr., "Wide-Body Transports" Archived 7 June 2013 at the Wayback Machine, in Chapter 13, "Jet Transports," in Part II, "The Jet Age," in Quest for Performance: The Evolution of Modern Aircraft, NASA SP-468, 1985, Scientific and Technical Information Branch, NASA, Washington, D.C., Updated: August 6, 2004, retrieved November 22, 2016. ^ "Airbus reviews A380 schedule," Archived 2 February 2017 at the Wayback Machine April 29, 2008, The New York Times, retrieved November 22, 2016. ^ "Hypersonic X-43A Takes Flight.htm," Archived 2 November 2016 at the Wayback Machine NASA retrieved November 2016. ^ "Fastest aircraft, air-breathing engine," Archived 20 December 2016 at the Wayback Machine Guinness World Records, retrieved December 2, 2016. ^ a b c d e f Jackson, Doug, "Ask Us – Aircraft Speed Records," April 22, 2001, Aerospaceweb.org, retrieved November 22, 2016. ^ "Fastest speed in a non-spacecraft aircraft," Archived 20 December 2016 at the Wayback Machine Guinness World Records, retrieved December 2, 2016. ^ Benson, Tom, ed., "Speed Regimes: Hypersonic Re-Entry," Archived 23 November 2016 at the Wayback Machine Glenn Research Center, NASA, retrieved November 22, 2016. ^ "Absolute speed record still stands 40 years later," July 27, 2016 General Aviation News, retrieved November 22, 2016. ^ a b "Ask Us – Fastest Airliner and Area Rule," Aerospaceweb.org, retrieved November 22, 2016. ^ a b "Fastest aircraft, airliner," Archived 20 December 2016 at the Wayback Machine Guinness World Records, retrieved December 2. 2016. ^ Whitfield, Bethany, "Cessna Citation Ten Chases Mach 0.935 Top Speed: Jet would retake speed prize from G650," Archived 20 July 2016 at the Wayback Machine August 28, 2012, Flying Magazine, retrieved November 22, 2016. ^ "Cessna rolls out first production unit of new Citation X," Archived 22 November 2016 at the Wayback Machine Apr 15, 2013, Wichita Business Journal, retrieved November 22, 2016. ^ "Guided Tours of the BGA". nasa.gov. Archived from the original on 25 March 2015. Retrieved 1 April 2015. ^ "ch10-3". Hq.nasa.gov. Archived from the original on 14 September 2010. Retrieved 26 March 2010. ^ "eCFR — Code of Federal Regulations". gpoaccess.gov. Archived from the original on 2 April 2012. Retrieved 1 April 2015. ^ "Airline Handbook Chapter 5: How Aircraft Fly". Airline Handbook. Air Transport Association. Archived from the original on 20 June 2010. Gunston, Bill (1987). Jane's Aerospace Dictionary 1987. London, England: Jane's Publishing Company Limited. ISBN 978-0-7106-0365-4. Look up aircraft in Wiktionary, the free dictionary. Note 2: For full-size aircraft with powered rotors the rotor is normally tilted to achieve thrust (e.g. in a helicopter). Some toys (e.g. balloon helicopter) do have a powered rotor with no means to tilt the rotor to produce horizontal thrust. Note 3: Ground effect vehicles and hovercraft are not included in the table, nor are experimental aircraft with novel thrust / lift solutions (e.g. coleopter, Flying Bedstead, Avrocar and flettner airplane) or balloon-wing hybrids (e.g. kytoon and hybrid airship).